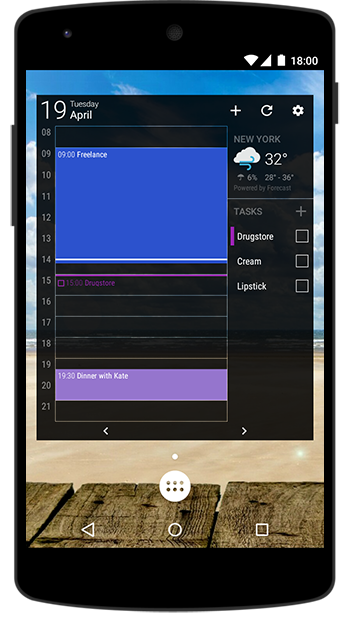 The Day Pro widget is a special advanced widget for pro users. It's included in the full pro package and in the package called Themes, Widgets & Font Sizes (please remember that weather will not be available in the last-mentioned package). This powerful tool integrates everything, that is important for your day: your events, tasks, birthdays and weather. All of that just at one glance! The widget is not only functional, it can be also pleasing to your eyes. In the widget you will find various settings that will allow you to personalize it in your own and unique way. 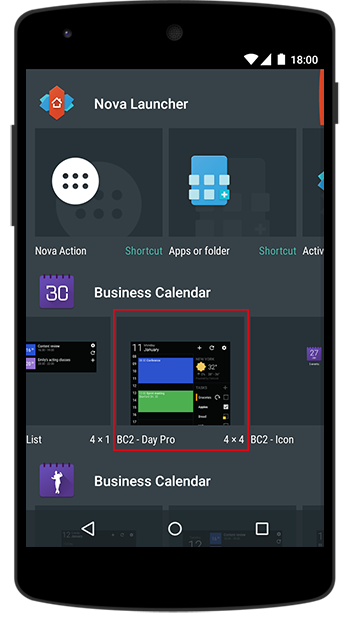 How can I access the Day Pro widget? In order to place the widget, you will have to find a free spot on your home screen and long press it. In an instant you will see the Widget category. 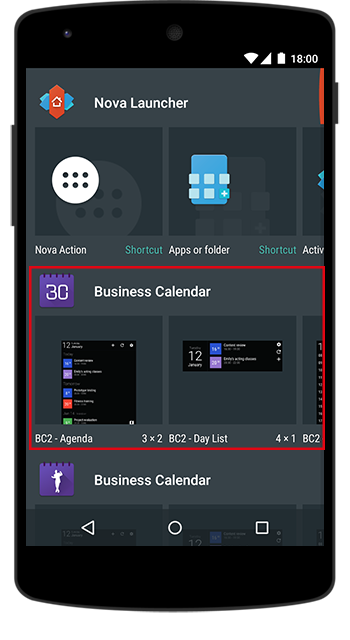 Click on it and look for Business Calendar widgets (the widget selection may differ on different devices / home screen launchers). 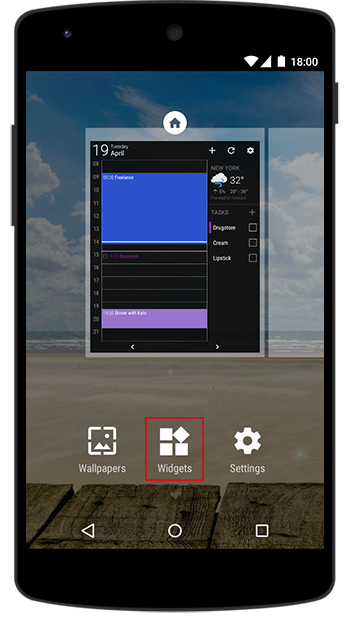 When you click on the widget selection, you will see a popup with all BC 2 widgets. 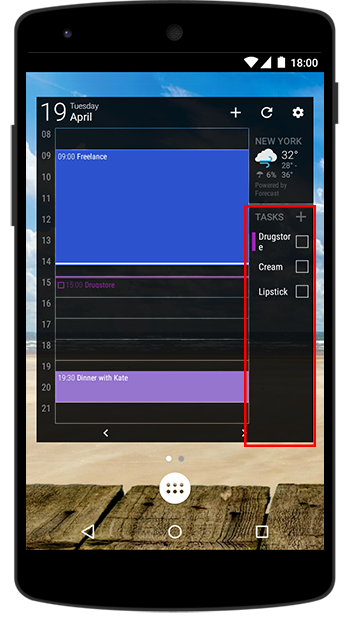 Look for Day Pro widget and drag it to the chosen place. Right now your can start customizing it. 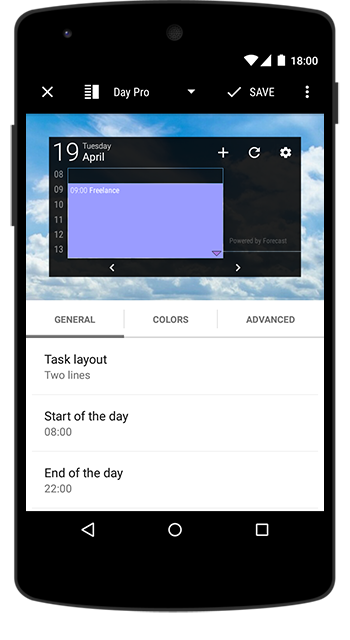 How can I customize the Day Pro widget? For general widget customization tips, please refer to our “How can I customize a widget?” help article. In the following section we will describe the settings typical to Day Pro widget only. The first important step in the Day Pro widget personalization is to choose, what should be displayed in the widget. 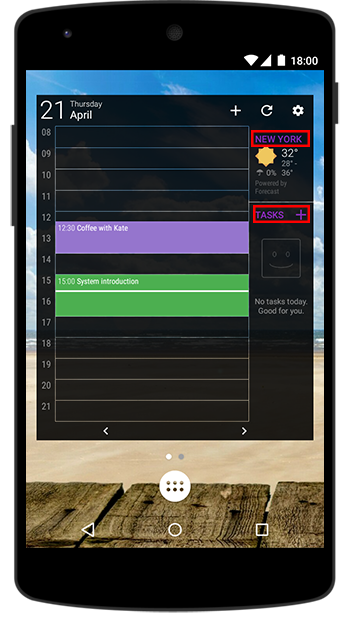 In the general settings you can decide, whether to show or hide the weather, tasks and birthdays in the widget. 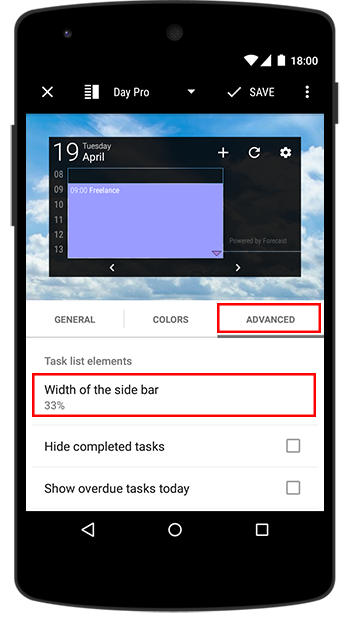 If you go to advanced widget settings and scroll down to Task lists elements section, you will be able to decide how big the sidebar should be (→ Width of the side bar) among other things. 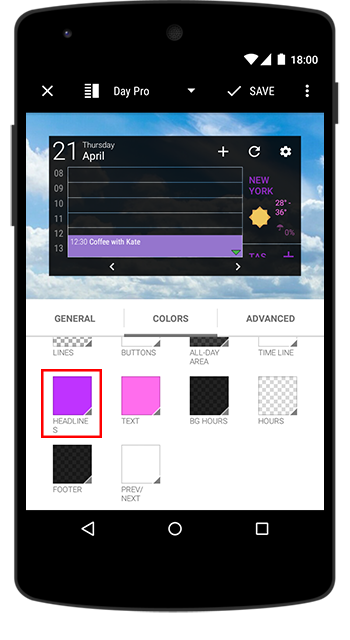 In the widget settings for colors, you can not only decide about header elects colors, or day area’s color. There are some color settings typical for Day Pro widget only that will make your widget event more personal. Apart from various widget elements (with which you can fully colorize elements such as background, footer, all-day area or background of the hour bar), you can also change colors in your sidebar. By clicking on the → Headline box you can change the color of the headlines in the sidebar (and of the name of the city you’re located in). Please note, that the following screenshots present only an example of different color settings. When you choose the custom color for →Text, it will colorize every other text item in the sector. Please note, that it will also apply to the task titles as long as you don’t choose to use the task list color for task title (check the → Colorize task title option below the individual colors section).